Your attention NEW - reaper ripe corn CORN MASTER. Maize is ripe for harvesting maize for collecting and further threshing of ears, crushing and throwing cormophyte mass on the field. Maize Maize CORN the MASTER . Now we can offer you an alternative corn header CORN the MASTER , performed in compliance with all specifications, used Czech expendable part of the header (chains, stars), Italian maslozaborniki. Gear grinders are made and manufactured in-house design department - for an initial import samples taken. Header easily enters the aisle seeded 8 and 16 inline seyalkami.Izmelchenie cormophyte weight and throwing across the field makes it possible to simply as the remains of plowed and improve the content of organic matter in the soil. 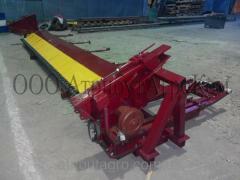 Combine Corn CORN MASTER - with integrated grinder. 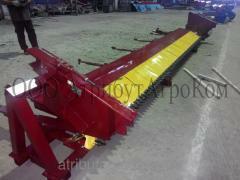 - the possibility of retrofitting for sunflower harvesting. The cutting height of 100 mm. The products are certified by the State Committee of Ukraine for Technical Regulation and Consumer Policy on the system "UkrSEPRO". 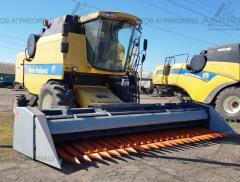 Unbelievable price on Reaper corn harvester New Holland, Lexion in Berdyansk (Ukraine) company AtributAgro, OOO.